The rug is very pretty. I thought the design would be smaller. Hard to tell from the photos. Elegant, free-flowing nature studies and richly stylized traditional designs. With their subtle color and inviting texture, these distinctive area rugs will bring the matchless charm of nature-inspired imagery to that special place in your home. Expertly power-loomed from top quality polypropylene yarns to ensure superlative texture and lasting beauty. The rug rolled out and as a beau soft cream with all the accent colors. Looked amazing in our dinning room with all the dark wood and dark colors. The delivery person ripped the bag in several places dragging it and left dark smudges on the underneath side of the rug, but they cleaned right off. "What are the colors in this rug? Thanks!" The colors are ivory, sage, cream, rust, light blue, and tan. 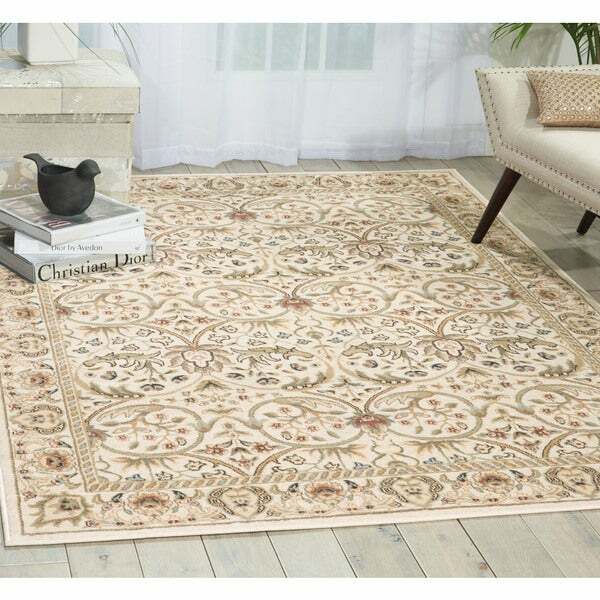 Nourion Walden Ivory Area Rug - 9'3" x 12'9"
Nourion Walden Ivory Area Rug - 7'10" x 10'6"